As long as the game of hockey exists, there will be discussions revolving around the greats of the game  who was the best player, who had the hardest shot, who was the greatest goaltender? And inevitably, for as long as the game is played, one name will come up again and again in discussions of the greatest netminders of all time. That name  Patrick Roy. 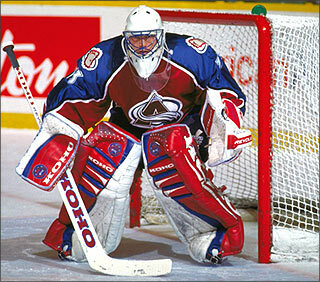 Born October 5, 1965 in Quebec City, Patrick Roy came by his athleticism honestly. His father, Michel, was at one time scouted by baseball's Brooklyn Dodgers and his mother, Barbara, competed provincially and nationally as a synchronized swimmer. Patrick's hockey career began not as a goaltender, but as a skater. "I played forward a couple of games outdoors," smiles Roy. "I was playing outdoors in a league and our goaltender got hurt. I said to the coach, 'I would like to replace the goaltender,' but the coach said, 'Nah, you're too small. I don't think it's a good idea.' There was another kid who wanted to be a goalie and they decide to put him in. the following year, in Squirt, it was my first year playing indoor and I said to my Mom, 'I want you to give my name as a goaltender.'" In his rookie season with the Montreal Canadiens in 1985-86, Roy played 47 games and took over the starter's role when the playoffs arrived. Patrick was given the opportunity to play goal, but had no visions of starring in the crease like Rogatien Vachon and his other goaltending heroes. "I liked the pads. I saw all that equipment and I wanted to wear it. It was a fun thing to do." As he progressed through the leagues in his hometown, Roy's skills developed and his interest in hockey grew even stronger. "The (Quebec) Nordiques started in 1979 and that was the exact time I was watching a lot of games," begins Patrick. "I had a friend whose Dad had season's tickets and I was going to some games. My Mom knew somebody that was working for the visiting teams at the time and he sometimes gave me goalie sticks from different players and I was playing with them in my league. It was a great moment in my life." Although his talent level garnered a great deal of interest locally, Patrick never thought seriously about an NHL career. "You dream that it'll happen but it doesn't always happen," he admits. 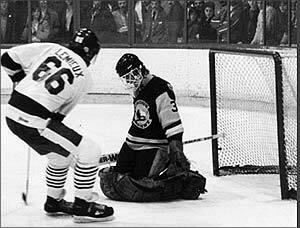 Nevertheless, the dream took a giant step forward for Roy in his second season of junior with the Granby Bisons. "I was at a (goaltending) clinic and one of the players there said, 'There's a couple of NHL teams looking at you.' I was like, 'Wow!'" That summer, Roy was drafted by the Montreal Canadiens in the fourth round of the NHL Entry Draft, the fifty-first selection that day. "It was always a dream to be an NHL player but to be honest with you, even when I was drafted, it seemed so far away. It seemed almost impossible that I could get a chance. I remember the first time I was in the Montreal dressing room, I thought it was almost impossible to be there." In 1984-85, Patrick played his final season of Junior with Granby, but he also made his debut in the National Hockey League. "I remember my first game. It was against Winnipeg," recalls Roy. On February 23, 1985, Montreal's Doug Soetaert had started the game. 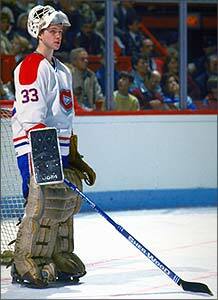 Patrick, who was the Canadiens' back-up netminder that night, picks up the scenario: "It was 4-4 after two periods and (Canadiens' coach) Jacques Lemaire came into the dressing room and said, 'Roy, get in the net for the third period.' I asked guy (Guy) Carbonneau if I had really heard correctly and he said, 'Yeah, you're going in for third.' I didn't get a chance to be nervous. I didn't get too many shots. I think the guys were nervous (playing in front of me) and I think I only had two shots. The defencemen blocked most of them. They gave me a lot of protection, I can tell you that!" The Canadiens won the game, and Roy registered his first NHL win. When his junior teams missed the playoffs, Patrick was sent to the American Hockey League to serve as back-up netminder for the Sherbrooke Canadiens, Montreal's AHL affiliate. After replacing Paul Pageau in goal following an equipment malfunction, Roy earned the win and went on to lead the Sherbrooke Canadiens to ten victories in thirteen games to lay claim to the Calder Cup as AHL champions. By the following season, Patrick had earned the starting goaltending assignment for the NHL's Montreal Canadiens. "When I started, I didn't know ten words (of English)," he laughs. "But I wanted to communicate; I wanted people to know what I was thinking. All during the year, I'd go to Carbo (Guy Carbonneau) and ask him, 'What does this mean?'" Roy got assistance in other areas, too. "The support that I had from my family and my agent at the time, Pierre Lacroix, was very important in my career," states Roy. "(Goaltending coach) Francois Allaire was one of the big reasons (I was in the NHL). He helped me with technique. I was always kind of a butterfly goalie and diving for every puck. (Coach Jacques) Lemaire told me I needed a mattress and a pillow! Francois changed my mentality. I started to do more side-to-side and added the two-pad slide. He really helped me work on rebounds. Instead of diving all over the place, (he taught me about) moving on my knees, using your toes to push aside. He taught me to have a better block with my glove. There were a lot of things that Francois Allaire really helped me with." The Canadiens, backstopped by their rookie goaltender, went on an improbable run that resulted in a Stanley Cup championship in 1985-86. "The fact that I played some playoff games in the American Hockey League and had a run for the Calder Cup really helped me a lot and brought me a lot of confidence," admits Patrick, who was rewarded for his excellence with the Conn Smythe Trophy as the premier playoff performer that spring. After a clash with Montreal Canadien management, Roy was dealt to the Colorado Avalanche where he would lead his new club to their first Stanley Cup championship. In 1987, 1988 and 1989, Patrick shared the Jennings Award for lowest team goals against average with Brian Hayward, earning the award on his own in 1992. He was selected to the NHL's First All-Star Team in 1989, 1990 and 1992, and to the Second Team in 1988 and 1991. Roy was recipient of the Vezina Trophy as the league's best goaltender in 1989, 1990 and 1992. By 1993, only Roy and his long-time teammate Guy Carbonneau remained from the team that had won the Stanley Cup seven years prior. That spring, Roy was sensational in leading the Canadiens to the Stanley Cup for an extraordinary twenty-fourth time in franchise history. With that victory, the Canadiens are alone in laying claim to having won hockey's championship trophy at least once in every single decade since the team's debut. Roy's record of sixteen wins against just four losses in the playoffs, including ten consecutive overtime victories, again earned him the Conn Smythe Trophy. During the 1995-96 season, Roy clashed with Canadiens' coach Mario Tremblay, and on December 6, 1995, he was traded to Colorado with team captain Mike Keane in return for Andrei Kovalenko, Martin Rucinsky and Jocelyn Thibault. "I would have liked to have left Montreal under different circumstances," he shrugs. "But now, looking back, I know I had great years with the Canadiens. I think we brought joy to Habs' fans and even probably surprised them somewhat with the two Cups we won. That's what I want people in Montreal to remember." Starting fresh with the Avalanche was a breath of fresh air (pun intended) for Patrick. "I knew what was going on in Colorado. It was a great organization. I had known (Avalanche GM) Pierre Lacroix for a long time, and Pierre was determined to find a way to win the Stanley Cup. I had played ten years in Montreal where the Stanley Cup was the number one objective, and then was going to Colorado and had that same goal as a team. I felt that with the offense that was on that team that we had a good chance to win the Stanley Cup. I knew the talent that was on that team and I was excited about the challenge. It was a perfect situation for me." Sure enough, on June 10, 1996, the conclusion of Roy's first season in Denver and the franchise's first full season in Colorado, the Avalanche captured the Stanley Cup, sweeping the Florida Panthers. In the fourth and final game, Patrick shut out the Panthers, and it was a goal by Uwe Krupp in the third overtime period that finally earned the victory. Five years later, almost to the day, the Avalanche again won the Stanley Cup, this time defeating the defending champion New Jersey Devils in a seven-game final. Patrick earned two shutouts against the Devils in that final, and sported a miniscule 1.58 goals-against average in being awarded the Conn Smythe Trophy as 2001's top playoff performer. It was a record third Smythe Trophy for Roy, a feat never accomplished by any other player. The following season, Patrick again excelled, earning the Jennings Trophy for the lowest goals-against average during the regular season, and was selected for the NHL's First All-Star Team for the fourth time. Still at the top of his game, Patrick Roy shocked the hockey world by announcing his retirement at the conclusion of the 2002-03 season. He had reached seemingly unattainable heights through his NHL career. In 1,029 regular season games (an NHL record for games by a goaltender), Patrick had won 551 (also an NHL record), lost 315 and tied 131, and earned 67 shutouts. During playoff action, he had won 151 times (an NHL record), including 23 shutouts, and lost just 94 in an NHL record 247 games played. "I was extremely comfortable when I retired," says Roy. "I emptied the tank." In a moving ceremony at the beginning of the following season, Roy's number 33 jersey was retired by the Colorado Avalanche. He was elected to the Quebec Major Junior Hockey League's Hall of Fame, the Colorado Sports Hall of Fame and in 2006, was inducted into the Hockey Hall of Fame. "It means a lot, it's the crowning achievement of my career," admits Patrick. "There were a lot of good moments but having the chance to be part of the Hockey Hall of Fame is something that I never thought would be possible. It means a lot to me." In the speech presented at his Induction, Roy addressed his many fans. "I feel very lucky to have played in the National Hockey League and on teams such as the Canadiens and the Avalanche. I remember the sacrifices, the discipline and the effort, but I also remember the friendships and the awesome feeling of being part of a team." 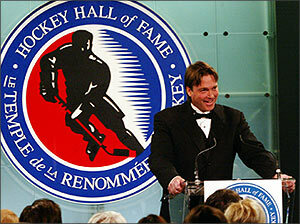 After congratulating his fellow Inductees, Patrick concluded by saying, "Long live hockey!" After retiring from the NHL, Roy joined the Quebec Remparts of the QMJHL as owner, general manager and, as of September 2005, head coach. In his first season behind the bench, Patrick led his Remparts to the 2006 Memorial Cup championship. "I like my role because I'm close to the ice and I'm working with young players, helping them on and off the ice," states Patrick. "It's a very good chance for me to give back. I like the chance to talk with them, to share with them a bit of my past experience. It makes it very fun for me."